Colder weather is here and you probably need a good, solid front door that will instantly give your house a facelift, while also keeping your house warm. Luckily, this is a great time of year to buy a front door and it’s also a great time to celebrate traditions! If you’ve got Mardi Gras on the mind, come check out our gorgeous front doors. 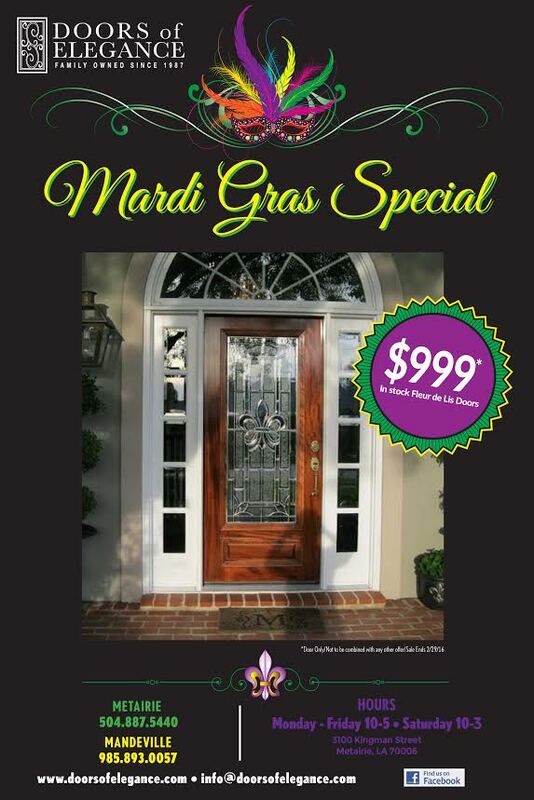 Not only do we have beautiful doors on sale, but our gorgeous, festive doors will last much longer than your traditional Mardi Gras celebration. Mardi Gras is one of the most popular celebrations that occurs around the world. For many people, this celebration occurs before the religions and fasting obligations that occur during Lent. In the United States, Mardi Gras is most commonly celebrated in cities that are traditionally ethnically French, such as New Orleans. Mardi Gras is one of the most popular festivals in United States, and it’s certainly a highlight for those that live in Louisiana. Those who attend carnival parties commonly wear costumes and masks. There is also plenty of dancing, parades, sports competitions and social conventions. It is a fun time of year that brings many memories and reasons to celebrate. Right now all in stock beveled glass Fleur de Lis patterned doors are on sale for $999 through February 29, 2016! Add a festive, yet elegant look to your house by choosing one from this collection. We have many in stock doors that feature a Fleur de Lis décor and they are all beautiful additions to any house. Full E is also a full panel decorative glass door but with more of a geometric look. Some panels of the glass on this door are beautifully etched. Another beautiful Fleur de Lis option is ¾ D. This one has a glass panel extending ¾ of the way down the door. In the middle of the glass panel is a gorgeous oval shape with a Fleur de Lis symbol in the middle. This is a more traditional looking front door and will immediately enhance the look of a house. Other options for doors include full glass panel double doors such as Fleur de Lis 1 and Fleur de Lis 5. If you would like to have a paneled wooden door with glass panels on the side that are decorated with the Fleur de Lis symbols, look to our Fleur de Lis 7 door. Check out our doors today to find one that will look amazing on your house. The symbol of Fleur de Lis has long ties to the celebration of Mardi Gras. In fact, legend has it that the symbol of Fleur de Lis became popular with Clovis, the King of the Franks. He was on his way to war and came across a field of Lilies on the banks of the Lys. In hopes of good luck and as a symbol of a future victory, he put one in his helmet. Eventually, he adapted this symbol as a sign of royalty and an attribute of sovereignty. Over time, the Fleur de Lis has adapted a strong religious meaning in that the power and the shape of the three petals is the shape of the Holy Trinity. For the Acadians and the Cajuns, who settled New Orleans, it has evolved to be a sign of dignity. In connecting Mardi Gras traditions, Louisiana has lovingly embraced this symbol. If you are looking for a stunning front door at a great price, look no further than our gorgeous Fleur de Lis collection. These classic, traditional-looking front doors will add curb appeal and elegance to your house that will last long past Mardi Gras.